Camping Salema Eco-camp Surf & Nature es un camping en Budens, Faro, situado en el bosque. Este camping en terrazas y camping con terreno inclinado tiene plazas con sombra, sin sombra y parcelas con algo de sombra. Cabe alquilar caravanas, casas rurales, Estudios y apartamentos. Este inspector visita cada año al Camping Salema Eco-camp Surf & Nature y lo inspecciona considerando más de 200 servicios y otros aspectos importantes. El inspector es un trabajador de ACSI y no trabaja para el camping. I have stayed at this site at different times over the last 5 years, more recently in July 2018. The management has changed over the last year, with clear changes. Upkeep is not as good, with a few major electric supply points not working, no improvements have been made to infrastructure. A wigwam area restricts available camping pitches, resulting in slight overcrowding. The wigwams appeared empty, but trendy! There is a clear move to attract a young surfer element. Food available was pizza or pizza, thin and expensive. No restaurant or even snack menu. I will not go back, at least robbers wear a mask. Really laid back site - park where you want as no defined pitches, nice bar that does excellent pizza. Good facilities, very friendly staff. The beach is a 10 minute bike ride. The best sites are up on top of the hill in the sun and breeze. But getting there is very convoluted as if finding a thing here. The naturist area sites are great if you can find them, but if you’re camping as we were the bathrooms are a long way away as the closer ones are full of old campers and trailers. All the bathrooms have obviously been worked on, clean, lots of hot water and TP. In the valley floor watch for mosquitoes at night. Staff helpful. Large site in wooded valley with various location for pitches. Access roads steep and best pitches are at the top of the site (although some distance from nearest sanitation block). Very helpful, English-speaking receptionist. Good value including electricity (low season). The nearest supermarket is at Budens. Now known as 'Salema Eco Camp'. Great campsite. Walking distance from beach and small town, but you can have breakfast/lunch or dinner at the bar at the campsite. There are very nice pitches. There is also a part for naturist, but this is a seperate part of the campsite. This site is now known as ‘Salema Eco Camp’. We stayed for 4 nights at the CC ACSI rate, brilliant value. It is now under new management and they are making big improvements. They have started refurbishing the toilet blocks, which are now a very good standard, loads of hot water with free tokens, and not a push button in sight! A new swimming pool is being built and the restaurant/bar is a great place to eat. We had our 47th wedding anniversary meal there and they made an extra effort to prepare a special meal. The local wine served in the bar is also available in the minimart @ €10 for a 5 litre box! The site is vast and some of the more remote pitches are a longish walk from the nearest toilet block but you are not allocated a pitch so it is your choice – peace and quiet with views across the valley or a more crowded spot by the facilities! There is water and electricity (10amp) within reach of most pitches. If you are not a naturist, don’t be put off as it is well away and the other side of the hill from the main site. A nice quiet camp site but charged at their normal rate -10%but weren't told this when booking in. It was therefore a surprise when we came to pay especially as we had to pay for each shower and for Internet which was only available by reception which was a trek from the pitch. I would not return to this site which we found on the App which does not give the rates as in the book. The area was lovely but will not go back to this site. Excellent campsite. Friendly, good food, freedom to choose pitch and many varied, and often deserted, beaches within 10 to 30 minute walk. Excellent and very friendly campsite. A bit of a walk to the village but worth it once you reach the beach and the local bars, etc. Fabulous walks along the coast - with many deserted beaches in little coves. Will certainly visit again. Lovely campsite, very quiet and well maintained. Would definitely use again. ¿Desea reservar u obtener más información sobre su Camping Salema Eco-camp Surf & Nature? Puede hacerlo mediante los datos siguientes. N125 Lagos-Sagres, después de 17 km dir. Praia da Salema a la izq. El camping está a la dcha. de la ctra. 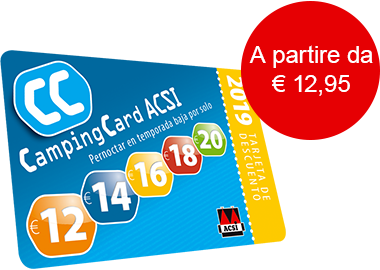 ACSI Eurocampings reenvía su solicitud de información al "Camping Salema Eco-camp Surf & Nature".